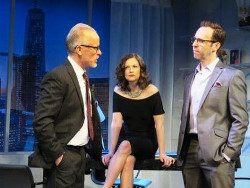 L-R: Conan McCarty, left, Eleanor Handley, Andrew Rein. Photo by SuzAnne Barabas. New Jersey Repertory, 179 Broadway, Long Branch. Thurs & Fri at 8PM; Sat at 3 & 8; Sun at 2PM. A two-year old phone-hacking issue, for which media giant International News Corporation had apologized, is back in the news via a leak by an unknown source, threatening INC's acquisition of media giant Clear Sky. If that sounds vaguely familiar, any similarity to real Murdochs – er, persons – is intentional. We're brought back two years to the London site of the original journalistic sin, then ahead a few days, still in London, and finally back to the NYC office, now Andrew's, 15 months after the first scene, where Roland gets his comeuppance…sort of. (Allaying our confusion, dates and locations are projected along a front border.) It could end there, but in a belated "the plot thickens” coda, the manipulation of Eleanor and Andrew's years-ago intimacy is yet to be revealed. It's all complex beyond necessity, but there's no denying the intrigue at its core, which some judicious paring will enhance. Canfora would be wise to keep these three excellent actors on board. Also, who knows if another director could bind them to the play as well as does Evan Bergman, who downplays the characters' types without negating them? The final scene of "The Source” leaves a question hanging. Depending on your need for a tidy ending, this can be thought-provoking or frustrating. Someone asked me what I thought happened with Eleanor after the events of the play. The smartest people in the world don't make predictions, I told her. Nor will I.